Tanks are designed for water or waste and meet all USCG standards. Each tank provides standard NPT openings for vent, fill & drain and the molded, FDA approved liners will not filter taste into water or emit waste odors. 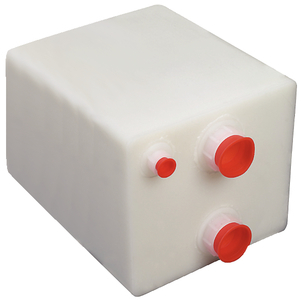 All tanks meet FDA spec CFT177.1520 requirements and feature a nominal wall thickness of 0.300". Note: 041239 tank measures 21.50"W at the top and 19.75"W at the bottom.Molded of FDA approved linear polyethylene which meets the CFR 177.1520 criteria.